Yesterday, the Colorado Secretary of State announced that U.S. Senate candidate Jon Keyser did not collect enough signatures (by a razor-thin margin of 86 signatures) to make it on the June primary ballot. Of course, Keyser has the opportunity to appeal the decision, and it’s likely that he will. This reality didn’t prevent Democrats across the state from gleefully celebrating. We hate to rain on Democrats’ parade. Actually, we love doing that. But, here’s another harsh reality for Democrats. However the primary turns out, all of the Republican candidates are in a far better position in this race than Democratic incumbent U.S. 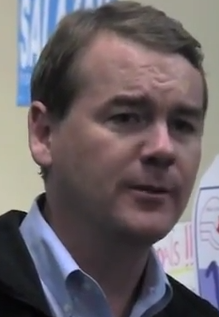 Senator Michael Bennet. The most recent poll showed that Bennet’s numbers are dismally low: just 30 percent of Colorado voters think he deserves to be re-elected. Think about that again: that means that 70 percent of Colorado’s electorate does not think that Michael Bennett deserves another term. In a similar poll, former U.S. Senator Mark Udall’s 2014 poll showed that only 41 percent of the voting population in Colorado thought he deserved reelection – and look at how that election turned out. If Michael Bennet is already eleven points behind Udall, he faces an uphill battle to victory. Michael Bennet is even less popular than President Obama – and his worst critics include fellow Democrats. Another thing to keep in mind – Bennet won his 2010 election by the slimmest of margins – .9% in a year in which Republicans basically blew themselves up in Colorado. Remember Dan Maes? Yeah, good times there. Yesterday’s hiccup in the Keyser campaign is just that – a hiccup. And there are two Republican candidates already on the ballot, Darryl Glenn and Jack Graham – both of whom offer a stark contrast to Michael Bennet’s blue-blood background. No matter what happens in the Republican primary, one thing doesn’t change. Bennet’s prospects still aren’t looking great. Guerin Green – I stand corrected! Bankrupting Denver Public Schools doesn't count as an accomplisment?